The community of Hatton is located 24 miles west of Interstate 29 in Traill County. It is centrally located between the communities of Mayville-Portland, ND, and Northwood, ND. 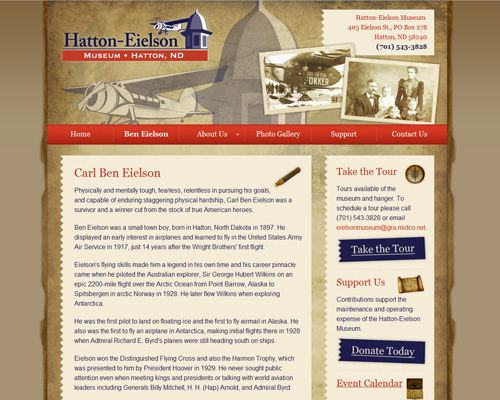 While visiting Hatton and the Hatton-Eielson Museum be sure to check out the variety of restaurants and bars including Sunset Restaurant and Lounge, Double D's Diner, and Buck's Place. Find comfort at the Hatton Campground located at the intersection of Railroad Avenue and 1st Street. Hatton is also home to a variety of retail stores including Miller's Fresh Foods, The Hatton Store, Timeless Memories, Hatton Ford, and Hatton Coop Oil. The surrounding communities of Mayville-Portland, Northwood, Hillsboro, Grand Forks, and Fargo-Moorhead also have many attractions and accommodations to complete your travels. Mayville-Portland is 15 miles southeast of Hatton on Highway 200. While in Mayville-Portland, you can find hotel accommodations at the Hometown Inn, pitch a tent at the beautiful Willowwood Campground/RV Park, or cozy up at the local bed-and-breakfast, 2 Oaks Inn. Mayville-Portland is famous for its variety of restaurants and bars. Paula's Steakhouse, La Cantina, The Pizza Shop, Videos Plus, and The Whistle Stop are a few of the yummy restaurants in Mayville-Portland. The Goose River Heritage Museum, Rainbow Gardens, Island Park, Portland Park, Mayville Golf Club, and Mayville State University are a must-see attractions when touring the area! Visit www.mayvilleportland.com for more information and many possibilities. Northwood is 15 miles northwest of Hatton on Highway 18. This beautiful community was struck by an EF-4 tornado in 2007 and has since rebuilt and beautified! Northwood has a thriving business community including Northwood Flower and Gift, Cool Stuff Drive-In, Guenthner's Super Valu, and Northwood Inn Laundromat and RV Park. Recreational facilities include the 9 hole golf course, swimming pool, baseball/softball diamonds, parks, and picnic shelters. Hillsboro is conveniently located on Interstate 29 between Fargo and Grand Forks, an easy 30-minute drive to the bigger cities. Hillsboro Hospitality, just a cup of coffee away! The county seat of Traill County, this hospitable community is known for its restaurants and bars: Country Hearth, Pizza Ranch, Sport Bar, Subway, Burger King, A&R bar, Granny's bar, and the Vet's Club. Hillsboro also is home to the Traill County Museum, a historic downtown, and Woodland Park on the Goose River. Woodland Park includes a picnic shelter, pool, parks, and easy shore fishing access to the Goose River. Make yourself at home at the Hillsboro Inn or park your RV or tent at the local campground, Hillsboro Campground and RV Park. Just a short drive north lies the city of Grand Forks. This community is home to the University of North Dakota, The Engelstad Arena, Alerus Center, Columbia Mall, and many big-box stores! Visit www.visitgrandforks.com for upcoming events and attractions. Southeast of Hatton on the crossroads of Interstate 29 and Interstate 94 are the cities of West Fargo and Fargo, North Dakota, and Moorhead, Minnesota. Fargo is home to the Fargo Air Museum, an excellent opportunity to learn more about North Dakota aeronautics! The metro community known as Fargo is the biggest city in North Dakota and features a variety of shopping opportunities both downtown and at West Acres mall. Restaurants are in abundance and can be found throughout the city... visit www.fmdining.com for your options! North Dakota State University, Concordia College, Minnesota State University Moorhead, and community colleges provide many festivities, attractions and events. For more information visit www.fargomoorhead.org.